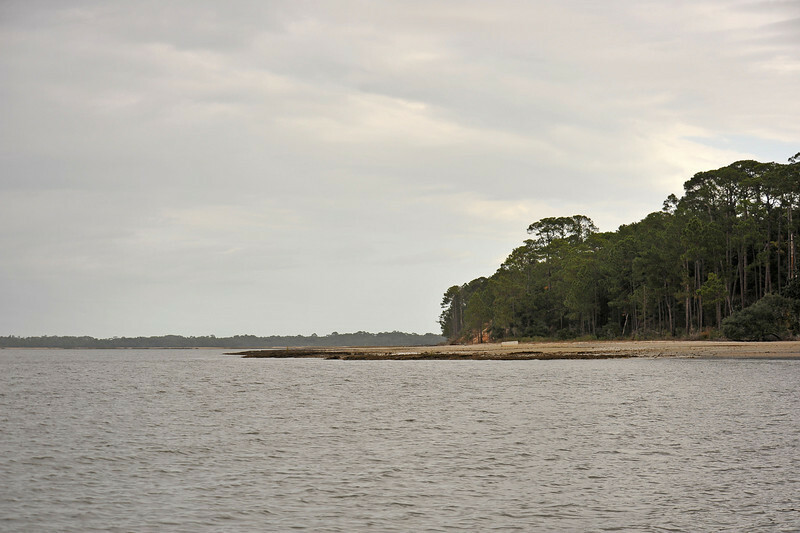 Cumberland Wharf Area - Cumberland Island, Georgia - Documented 11-29-10 - Sweeping view from the Wharf to the North towards Little Cumberland Island. Note the severe erosion in the bluff. All that is left of he wharf are the broken off post stumps. The wharf is situated in front of a valley in the bluff. Nautical charts show a shipwreck just to the right of the wharf...perhaps under the length of the oyster bed shown? The bluff would have extended quite a bit out into the river 200 years ago. Images taken near low tide. COMPARE LAST TWO IMAGES with Photos numbers 18, 31, and 32.